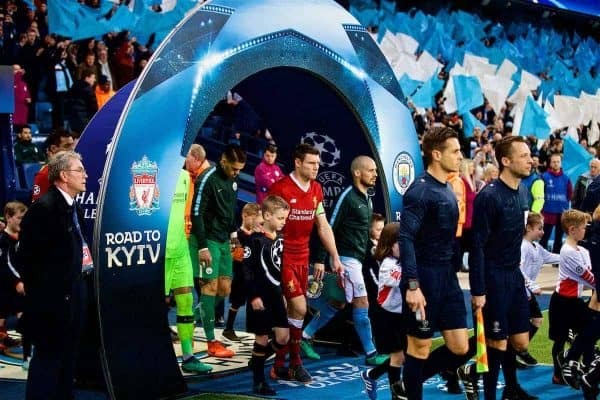 Liverpool are through to the semi-finals of the Champions League for the first time in 10 years after beating Man City in the second leg and on aggregate. Ahead of kick-off there were scenes of jubilation on social media as fans celebrated Mohamed Salah‘s name on the team-sheet as if it meant he’d already scored ahead of kick-off. His return, along with Andrew Robertson‘s, was of course important—but within two minutes of the actual game starting, that positivity was gone. Football, especially at this level and this stage of the competition, plays havoc with emotions like little else on the planet. It was immediately desperation, struggle, clinging on for the half-time whistle—despite still being two goals to the good! 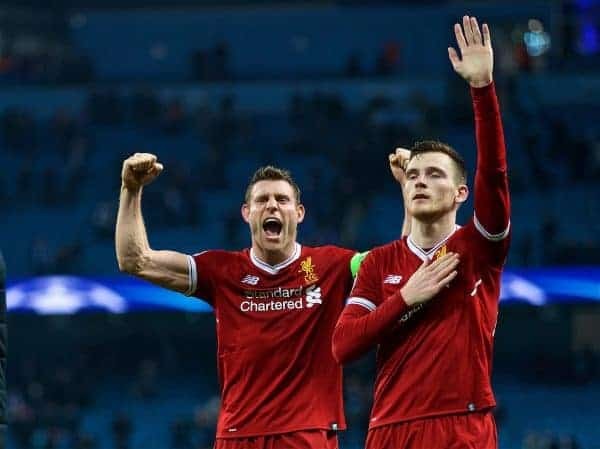 The match as a whole serves as a reminder that nothing is won early on, nothing is settled in the opening 10 minutes, and as the Reds grew more into the match it was more and more apparent just how good the team has become. It was a point Klopp made during his post-match press conference, emphasising the lesson learned and the recovery from that early onslaught. City dominated the first half like few other teams have managed this season, even including Liverpool themselves against some teams. The pressure was relentless, their passes forward-thinking… but really, after Jesus’ opening goal, they created very little. Bernardo Silva hit the post with a great strike, Leroy Sane had a goal wrongly disallowed after a fortuitous deflection fell his way. That’s it; not just for the first half, but for the entire 180 minutes of the two-legged tie. Crosses were dealt with, runs behind the full-backs were tracked almost without exception, deliveries were blocked or headed clear, repetitively and at times with great bravery. All of this is a sea-change from Liverpool of earlier this season, or last year, or indeed for about half-a-dozen campaigns previous. A solid defence is a critical part of a successful team and the Reds have now put the foundations in place to have one of their own. As much defensive work as Jurgen Klopp‘s team had to get through in the first half, he knew perfectly well his team would get chances during the game. And Liverpool would probably have to take one of them. Going with three forwards was brave, certainly not something every manager would have done in an away leg when three goals up, but Klopp’s prediction was spot-on. The Reds had to bide their time, but when they got chances, they took them. 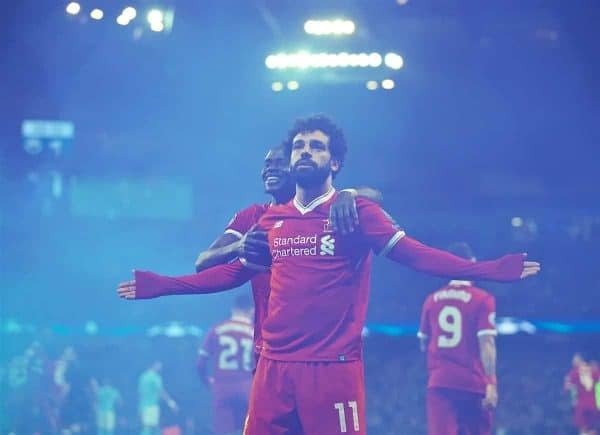 Salah’s equaliser utterly deflated City’s players, and it was just about the first real chance Liverpool had managed to create on the night. When Bobby Firmino followed up with a second, it was game over, but it was also the clearest opening either team had managed to create in the second half. Liverpool, ultimately, were better than Man City in both penalty boxes. Yes, this game was about getting through to the semi-finals. And yes, this season is about achieving success and memorable moments for this very campaign. But make no mistake, it’s also about staking a longer-term claim for positions at the club, making a case for future inclusion when transfers will inevitably strengthen the squad, this summer and beyond. 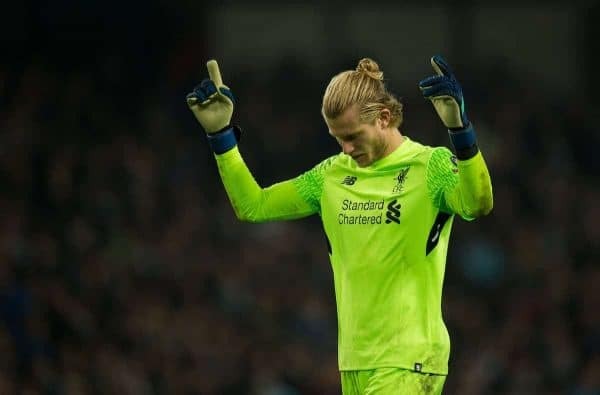 So it’s another big moment in the reemergence of Loris Karius as first-choice goalkeeper, another reminder from James Milner that he has much to offer. He, particularly, has been immense in 2018. Gini Wijnaldum also made another case for the role he could play last term; with Naby Keita incoming, game time as a No. 8 might be at a premium—but he’s played very well once more as the deepest midfielder. 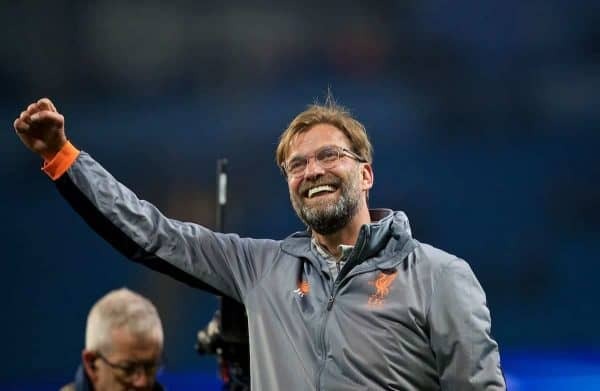 And Klopp himself once more reinforced his credentials as one of the game’s very top bosses, someone many, many top players would love to come and play for. Barcelona are out. Manchester City are out. AS Roma are there too, improbably and impressively, while Real Madrid are likely to join them and the fourth semi-finalist should be Bayern Munich over Sevilla. 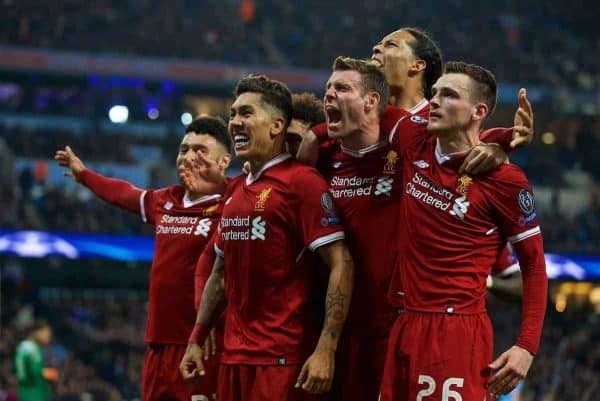 May 26, book it in now and don’t make plans—because Liverpool are going to be there, and Liverpool are going to win it. The momentum, the excitement, that relentless sense of belief sparking memories of Olympiacos, of Juventus and Chelsea…they are all growing again. And with reason: Klopp is going to win No. 6.